Carol and I are just back from an exciting Alaska cruise with our friends at Crystal Cruises. We had a glorious sailing and you can read about our first impressions of Crystal Cruises by clicking here. I snagged this photograph as the Crystal Cruises Serenity did a 360º spin in front of the glacier so that all aboard might appreciate her splendor. The skies were sprinkling light rain, and there were eerie low-hanging clouds enveloping the fjord all around us. While I was a little bummed to find the skies so full of rain, fog, and clouds, it does create a special photographic opportunity as the bright sunlight isn’t washing out the colors. Actually, in hindsight, this is now one of my favorite photographs of the Margerie Glacier. To give you a sense of scale, the width of the Margerie Glacier is about 1 mile (1.6 km) and the total height at its terminus is about 350 feet (110 m) including 100 feet (30 m) that is underwater. So, you’re looking at ice that is 25 stories above the water. It’s monstrous! Another thing your senses will notice right away is that the temperature is about 10º cooler here than at the mouth of Glacier Bay National Park. When we got to the glacier, the temperature was 48º. A bit chilly, but it absolutely added to the drama of the moment. If you’d like to learn a little more about Alaska’s most visited glaciers, read our article: Best Alaska Cruises for Glacier Viewing. This was our third sailing in Alaska, and to be honest, we never grow tired of the beauty, majesty, and unspoiled wilderness that is constantly all around. We love cruising Alaska, and we highly recommend it to you. If you would like to know more about cruising Alaska’s beautiful Inside Passage, call our office at (480) 550-1235, or use our convenient online information request form (click here) and we’ll reach out to you. 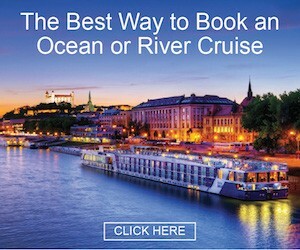 To learn more about Crystal Cruises, click here.